Dolphins are very similar to us: they are intuitive, supportive, coexist with the world and of course, they can stress out as well. Unfortunately, pollution has caused damage to their environment, impacting on their navigation system, which has made them even more defenseless. Have you felt that the world comes to an end when something happens to technology and you simply can not access Google Maps or Waze to know where you are and where to go? Dolphins have a similar system that helps them navigate in a safer way, with a range of up to 656 ft. It is called 'echolocation' and consists of making a quick scan of their environment through sounds. The dolphin produces a click-like sound. The sound collides with what is around it and comes back. The time it takes for the sound to collide and return depends on the distance between the dolphin and the objects. The dolphin 'interprets' the vibrations and turns them into a 'scan' of the objects, which allows him to create a mental map to navigate avoiding obstacles. Fiction can help us to understand this because superhero films like Daredevil - in which the protagonist is blind and uses a power similar to echolocation to be able to 'see' - have tried to represent this ability. Now that you know how amazing this feature is, you should know that pollution is causing a damage that could be irreversible. The head and jaw of the dolphin work as antenna and ears for their navigation system. So, if their 'ears' are damaged, they suffer just like we would. 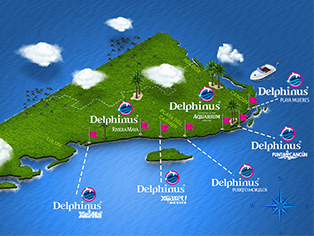 That is why it is very important that during your experience of swimming with dolphins in Cancun, you enjoy this wonderful experience of contact with nature and know more about marine species and become aware of the great responsibility we have as a human species to preserve the seas and prevent both dolphins and other species from being affected by the pollution we produce.